He was in for the right thing. Twelve acres lying east of the cross fence. State of N. Carolina, Wayne County, March 31st 1884. Item I. I commit my soul to God and my body to the Grave. I desire to be decently and plainly buried, and the expenses of my burial to be paid first out of any money I may have or the first that may be raised out of the proceeds of my property. Item II. I give to my Grand-daughter Sarah Simmons, my cow and yearling. Item III. I give in fee simple to my daughter in law Sally Winn widow of my deceased son David Simmons: Twelve acres of land, lying East of the cross fence between my house and hers, and next around and including the house where she is living, to be surveyed and marked only by competent Surveyor, under supervision of my Ex’r or Admin. Item VI. The balance of money now remaining after above I bequest I order to be divided into three equal parts – and to be given one part to my Grand Daughter Maria Thompson one part to my Grand daughters Sarah Simmons and Gustus Greenfield equally and the other part to my son Moses Simmons, if he living, is [sic] he is dead, and leaves no legal heirs of his body, Then this part bequeathed to Moses Simmons shall be divided one half to Maria Thompson and balance between Sarah Simmons and Gustus Greenfield, my Grand-daughters above mentioned. Wayne County Will Book 1, Page 255, Wills, North Carolina State Archives. W. Frank & Sarah Simmons. WILLIAM FRANK SIMMONS was the son of Bryant Simmons and Elizabeth Wynn Simmons. 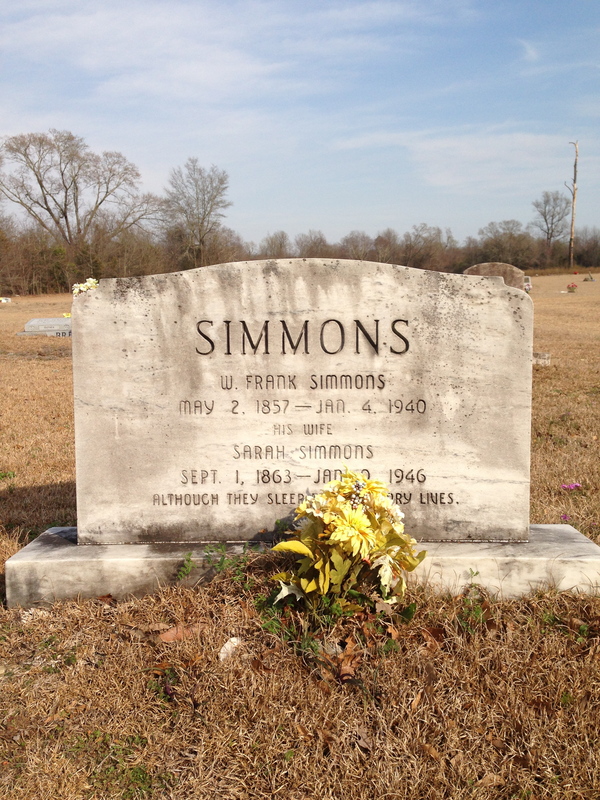 SARAH WYNN SIMMONS was likely related to Frank’s mother, but her parentage is not clear. They are buried at First Congregational Church cemetery, Dudley, Wayne County. 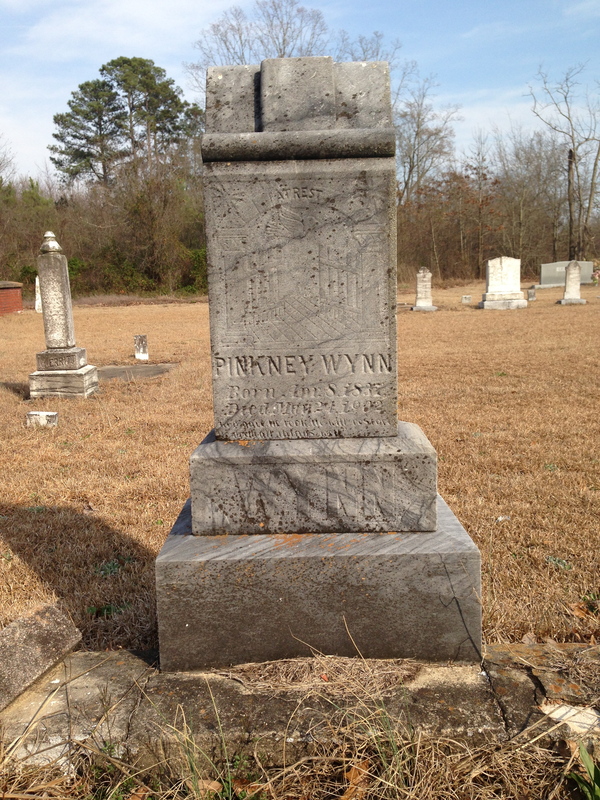 PINKNEY WYNN was born about 1840 to Levi and Bertha Winn, probably in northern Duplin County. He married Elizabeth Winn, who was probably his cousin, but whose parentage is not clear. 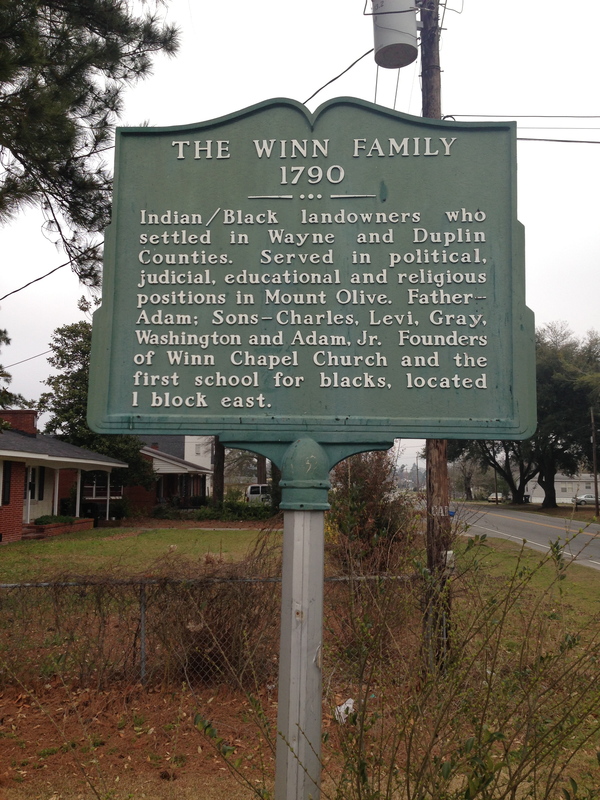 He is buried in First Congregational Church in Dudley, Wayne County. 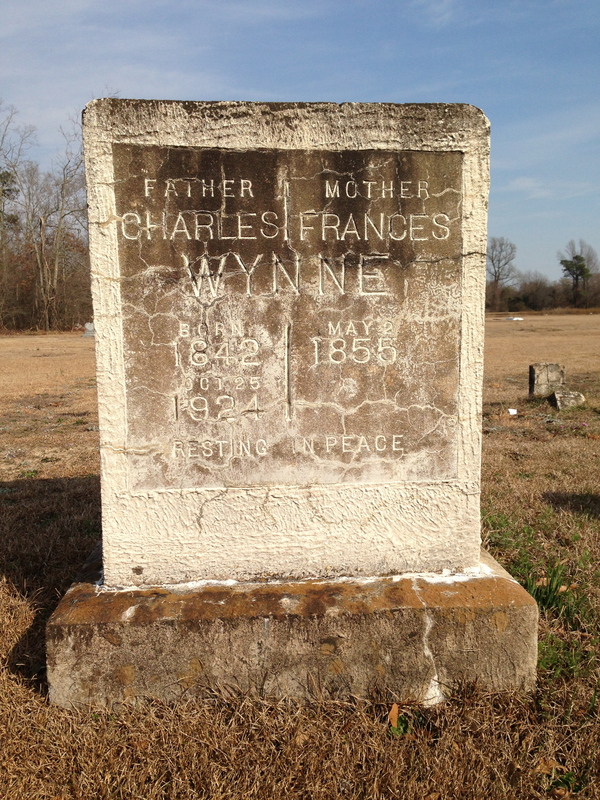 CHARLES WYNN was born about 1842, probably in northern Duplin or southern Wayne County, to Levi Wynn and his wife, Bertha. FRANCES ALDRIDGE WYNN, probably born in southern Wayne County, was the daughter of John Matthew Aldridge and Catherine Boseman (or Simmons) Aldridge. They are buried in the cemetery of First Congregational Church, Dudley, Wayne County.